Climate change activists waited for Gov. 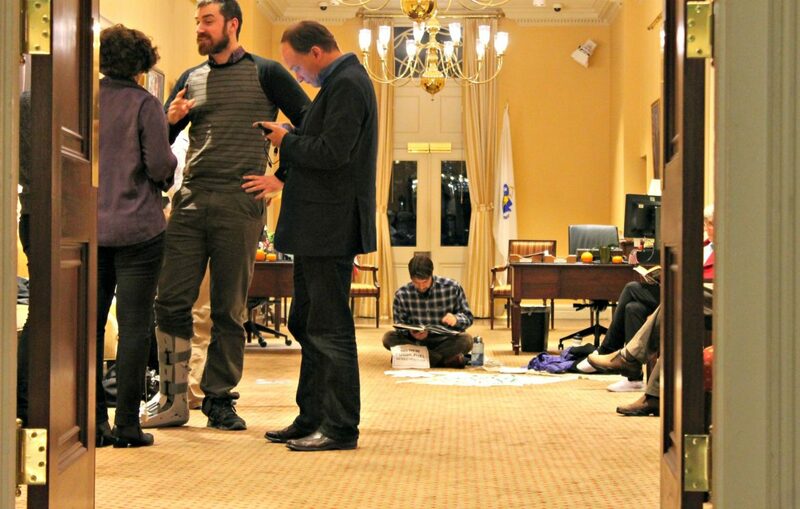 Charlie Baker's office to close on Wednesday evening (Nov. 8) during a sit-in to demand Baker sign an executive order discouraging new fossil fuel infrastructure. Baker responded on Thursday, defending his record on clean energy and saying "we shouldn't be painting ourselves into a corner, especially in a sector like this where the changes are coming fast and furious." That’s the time-honored credo of the Massachusetts Legislature, and it was in complete effect as the last full week of formal legislative sessions arrived — for 2017, that is. Why it should be necessary to wait 10 months to pass statutes for which everyone acknowledged a need in January can only be explained by the legislators themselves, and let’s face it, the explanations are never really that good. Whatever the ultimate reason (human nature, justification for a full-time Legislature, and a lack of absolute deadlines are suspected), the House and Senate again headed into the final few days of formals for the year having put off for November what they could have accomplished in February, May or September. The House will take up criminal justice reform this week, several years after reform was generally recognized as desirable, while the Senate last week tackled health care cost containment measures the governor said were badly needed — months ago. But from the sounds of it, Baker and the state’s insurers are singing better never than late on the cost front, with the governor and insurance executives suggesting senators badly missed their cost control goal while checking off some other boxes on their health care policy preference lists. Senate Democrats pushed through their massive bill at midnight Thursday on a 33-6 party-line vote. Senators dismissed Baker’s cost critique [see more below], citing his past ties to industry, and asserted they are merely trying to repair the many “broken” aspects of the health care system while also making it less costly. All of this spoke to an issue driving once and future political campaigns: health care. And for that matter, present campaigns as well. In Tuesday’s elections, voters in Maine took the singular step of telling their governor to expand Medicaid coverage and take full advantage of Obamacare. That stinging rebuke to the Trump approach was part of a first Tuesday in November widely seen as a repudiation of the president’s style and rhetoric, though there was nothing stylistic about the Maine Medicaid vote — it was a flat repudiation of the conservative approach to government-run health coverage. While pundits nationwide watched Virginia and Maine and the Virginia House of Delegates race (won by transgender candidate Danica Roem) as electoral pulse-takers, Election Day in Massachusetts was much more of a confirmation that the electorate’s vital signs were normal. That is to say, a Trump-loathing mayor was overwhelmingly endorsed for a second term in Boston, and Democrats swept the races where it was D vs. R.
It’s the House’s turn on Monday and Tuesday to debate crime and punishment, and the House is also newly in receipt of an omnibus Senate healthcare bill. Senators were torn in late October as they approved a justice reform bill on a 27-10 vote. While House leaders are punting health care into 2018, they are poised to do the work necessary to get a criminal justice bill into conference committee over the seven-week holiday season break. House lawmakers had filed 212 proposed amendments to the justice bill (H 4011) by the Thursday evening deadline. Senate leaders meanwhile have an opportunity this week to keep free birth control on the fast track that the House placed it on last week. The House voted 138-16 to approve the contraception bill, pitching it as a rebuke to President Trump and his executive order intended to enable employers to avoid contraception coverage on moral grounds. Lawmakers who started the 2017 session by voting themselves big pay raises also may cap formal sessions for 2017 by lighting up a big long-term borrowing bill with favored capital projects. Both branches will hold sessions through the holiday break but Monday, Tuesday and Wednesday are the final days, under joint legislative rules, for formal sessions at which recorded votes are allowed. Recorded votes are required to enact bond bills and veto overrides; most other bills can advance in informal sessions as long as no one objects.
.@SpeakerRyan wants to blindly rubber stamp @realDonaldTrump‘s agenda without any debate in Congress. A fixture in Massachusetts politics since the 1970s, Secretary of State William Galvin plans to seek re-election. “I’m running,” Galvin, 67, told State House News Service Thursday when asked about his plans. William Galvin plans to run for a seventh term as secretary of state. Galvin was first elected secretary of state in 1994 and has held the position since then. In asking voters for a seventh term next year, Galvin will likely suppress pent-up interest in the office among Democrats. Over the years, he has rarely faced major challenges. Ensuring an accurate 2020 Census count is a priority, he said, mentioning the importance of counting all immigrants, college students and senior citizens. The Brighton Democrat was first elected to the Massachusetts House in 1975, the same year Jim Rice and Fred Lynn were breaking in with the Boston Red Sox, and served there through the 1980s. In 1990, Galvin defeated former House Speaker George Keverian in the Democratic primary for treasurer, before losing that race to Republican Joe Malone. Galvin began his long run as secretary of state after defeating Augie Grace in the 1994 Democratic primary and former Republican Sen. Arthur Chase in the general. In 2002, when he was 51, Galvin briefly ran for governor before opting to seek another term as secretary. The secretary of state’s office over the years has been assigned a long list of powers and duties. Galvin is the state’s chief securities regulator and election official, oversees public records and lobbyists, and runs the corporations division, the historical commission, and the Massachusetts Archives. Col. Richard McKeon, whom Gov. Charlie Baker appointed to head the State Police in the summer of 2015, will retire this month amid allegations that he improperly ordered a trooper to delete embarrassing details from an arrest report for the daughter of a state Trial Court judge. McKeon announced his plans to retire late Friday in letters to his fellow police officers and Public Safety Secretary Daniel Bennett, a day after Baker indicated he planned to wrap up an internal investigation into the incident quickly. The Baker administration launched an investigation into McKeon’s handling of the arrest report of Alli Bibaud after the arresting trooper, Ryan Sceviour, filed a lawsuit against several of his superior officers, including McKeon, claiming he was reprimanded and forced to alter his report to shield Bibaud’s father, a judge, from the public release of embarrassing details. Judge Timothy Bibaud is a Trial Court judge in Dudley District Court, and oversees the drug court in that jurisdiction. Alli Bibaud was arrested after Sceviour responded to an accident on Interstate 190 in Worcester last month and found her in possession of a heroin kit. She failed several field sobriety tests and was charged with operating under the influence. The details later scrubbed from the arrest report included statements made by the defendant that her father was a judge and would be furious with her, and that she would perform sexual acts for leniency, and had done so to obtain drugs in the past. “Leaving aside the details of the incident which you know, my decisions to instruct subordinates to focus the arrest report on information relevant to the charges made against this individual without compromising the strength of the case is instruction that I have given to the men and women under my command more times than I can remember. This is not unlike the thousands of cases we are involved in every year involving drug addiction,” McKeon wrote in his letter to Bennett. Baker, in a statement, thanked McKeon for his service and wished him well in retirement. “The Governor believes that Colonel McKeon made a mistake by getting involved in the Bibaud case and has ordered the State Police to examine procedures for the review of arrest reports. Governor Baker recognizes the motivation to protect those with substance use disorders from potentially embarrassing information contained in their public records and expects the courts to hold the defendant accountable for all charges stemming from this incident,” spokeswoman Lizzy Guyton said. 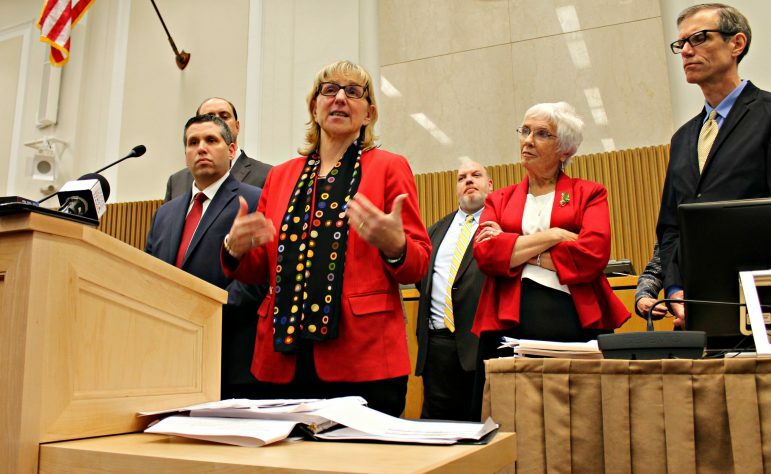 Senate Ways and Means Chairwoman Karen Spilka shot back at Gov. Charlie Baker amid the Senate’s second day of debate on a health care overhaul Thursday, taking issue with his claim that the Senate’s bill won’t save any money. Sen. Karen Spilka had harsh words for the Baker administration’s healthcare reform stance earlier this year. And she’s still none too happy. Spilka, an Ashland Democrat, went one step further, saying the savings estimates she has given are based on analysis Baker’s administration provided the Senate in June. Speaking to reporters early Thursday afternoon, Baker said his greatest concern with the Senate’s health care bill (S 2022) is that it doesn’t save Massachusetts any money. “I think the fact that the Senate has acknowledged that its bill doesn’t really save any money was a good thing, I mean it’s basically a statement that they’re not trying to save money here, they’re not trying to chase reforms that are going to make the program more affordable,” he said.